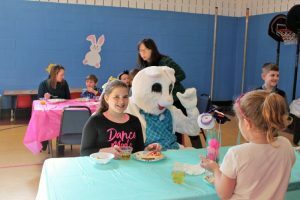 FULTON – Families can get an early start on the Easter season at the Fulton Family YMCA’s Breakfast With The Easter Bunny event, April 6 from 10 a.m. – noon at the YMCA, 715 W. Broadway. Children and parents will enjoy creating an Easter craft and a breakfast of pancakes, cereal, sausage, fruit and milk or juice. They will go home with a special photo to remember the day. Breakfast With The Easter Bunny is $7 per person for YMCA members and $10 for non-members. Registration closes April 3. To register come by the Fulton Family YMCA or call 315-598-9622. “I want to invite everyone to come enjoy this event as they make a new family memory. The YMCA is about more than just physical health. We’re about connecting and growing our community through many programs and services. In encourage everyone to take advantage of this opportunity for some quality family time,” said Shonna Sargent, chief executive officer. The Fulton Family YMCA is part of a powerful association of men, women and children committed to bringing about lasting personal and social change. With a focus on nurturing the potential of every child and teen, improving the community health and well-being and providing opportunities to give back and support neighbors, the Y enables youth, adults, families and communities to be healthy, confident, connected and secure.